When you create an instance of an object, you may want to pass different combinations of parameters for purposes of initializing the object. In authoring a class, there are a couple different ways to support this. You can declare multiple constructors, each supporting a different set of parameters. You can use constructor chaining to invoke the main constructor, to centralize object initialization. You can also use optional parameters in a single constructor, to do the same thing. 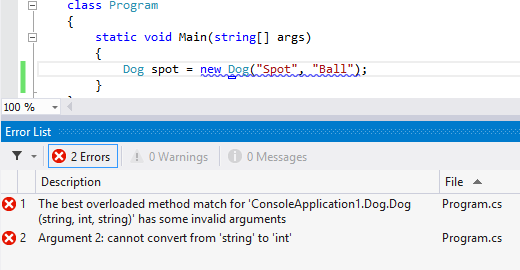 When you’re working in Visual Studio and you start typing in the name of a method, Intellisense will show you any optional parameters that the method has. In the example below, we’ve started entering code to create a new instance of a Dog object. 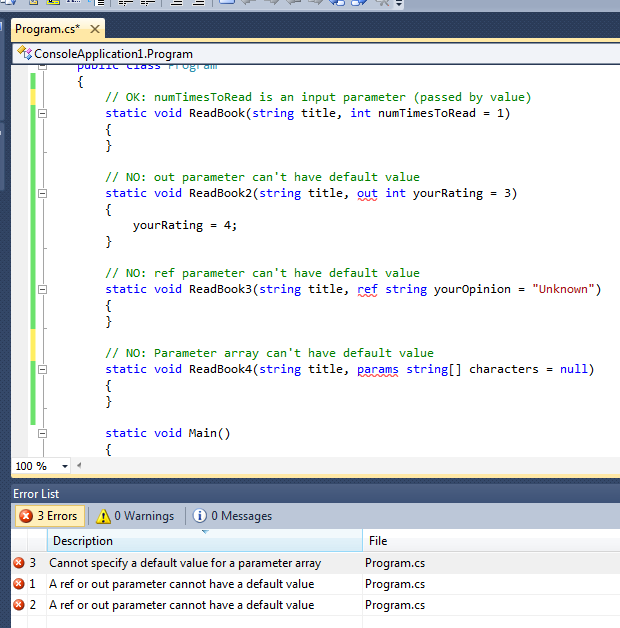 Intellisense shows us a list of the optional parameters that are defined for the constructor.